I've been happily applying clumps of bamboo fiber and long water-weedy trails of dyed ribbon to "Drowned Woman." Now it's time to step back and...ok, first I need to pick out and re-sew that one piece of ribbon that has an angle in it. And then I get to pin up various bits of painted lace that look, I hope, very coral-ish, and stare at the thing, and try to decide if that's too much, and pin up the ombre sheer that's to overlay the whole piece and see how it looks. The thing is, I painted a lot of lace, and I don't think there's room for more than 3 or 4 pieces, and...oh, well. 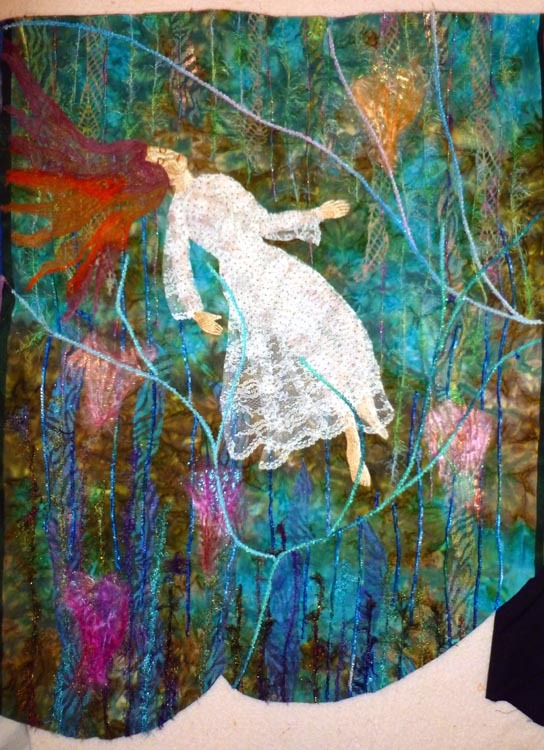 I can see another water-themed quilt in my near future; I've got to do something with all the leftovers from this piece, hand-dyed sparkly ribbon and silk ribbon and gauze and organza and painted lace. Probably won't make a decision before we leave for the beach, where I plan to spend several days placidly bobbing up and down in salt water, alternating with hand quilting "Shrine Composition II." I really like the 'water' feel to this piece. Enjoy the beach! You may even pick up some 'finds' to add to this piece while you're there!